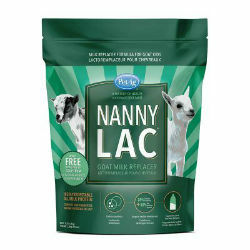 Formulated for all breeds of goat kids, Nanny-Lac™ provides complete and balanced nutrition in a highly digestible, easy-to-mix, all-milk protein powder. Contains probiotics, a source of naturally occurring microorganisms. Fortified with essential vitamins and minerals. Includes colostrum bonus pack* to support kids who do not receive enough maternal colostrum in the first 24 hours of life. Dried whey protein concentrate, dried whey, animal and vegetable fat (preserved with BHA and BHT), dried whey product, lecithin, dried skimmed milk, DL-methionine, L-lysine, vitamin A supplement, vitamin D3 supplement, dried yeast culture, vitamin E supplement, vitamin B12 supplement, folic acid, choline chloride, riboflavin supplement, niacin supplement, calcium pantothenate, thiamine mononitrate, sodium propionate (preservative), citric acid (preservative), potassium sorbate (preservative), calcium propionate (preservative), ferrous sulfate, copper sulfate, cobalt sulfate, zinc sulfate, manganese sulfate, magnesium oxide, ethylenediamine dihydroiodide, sodium silico aluminate, sodium selenite, artificial flavor.